This café aims to be the essence of chill-out, calm and cool. It is a space for a broad demographic to enjoy the view and atmosphere of the project hub in simple comfort that is both non-obtrusive and non-selective, meeting the individual’s needs: be it a private table, a soothing sofa, a casual island table, sociable bench or trendy bar- inside or out! A place for a coffee during the day or a laid back ‘in your living room’ drink and snack in the evening. The Caffè Nero philosophy is very simple: Premium, handcrafted Italian coffee. Caffè Nero always use double shots of espresso in all regular and grande size drinks, which means a great coffee flavour. Espresso is traditionally handcrafted and made in the classic Italian way – well structured, full bodied, aromatic, rich and strong. Choices range from espresso-based, hot or iced, to a rich selection of fruit boosters, teas and milkshakes. 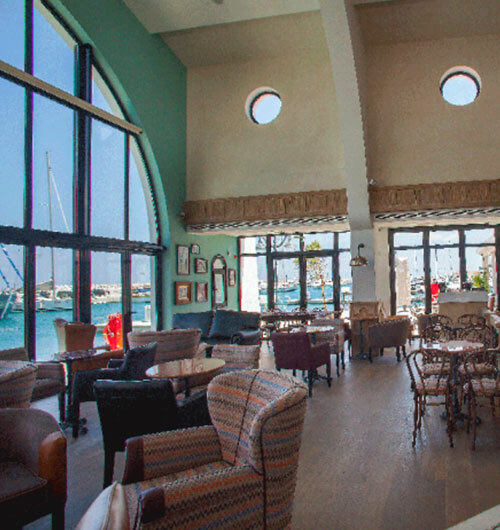 Epsilon Resto Bar at Limassol Marina, is the latest addition to PNS Restaurants. It will enchant guests with its modern yet cozy indoor ambiance and verandas with outstanding views. The tantalizing options on the menu bring a selection of authentic Mediterranean dishes with crafty hints of international fusion to our visitors, who are able to unwind to the DJ’s tunes by the full service bar with its extensive list of wines and cocktails. Hobo Mediterraneo is the place where every moment is precious. 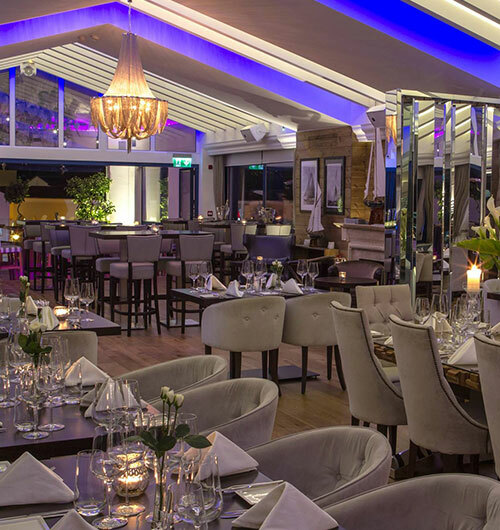 It has an all-day character where every hour, one may enjoy quality coffee, indulgent desserts and most importantly exceptional Mediterranean dishes, accompanied by a glass of wine or unique freshly prepared cocktails. On top of its exclusive location, its meticulous architecture and elegant decor define the café-restaurant as the ultimate place for everyone to spend their day and night. KFC is the world’s most popular chicken restaurant chain, specializing in original recipe chicken, hot and spicy chicken, crispy strips, burgers, wraps, nuggets and hot wings, home-style sides, snacks, salads, sweets and drinks. Fresh and high quality chicken, delivered daily by selected suppliers to our stores and freshly prepared by dedicated KFC cooks. 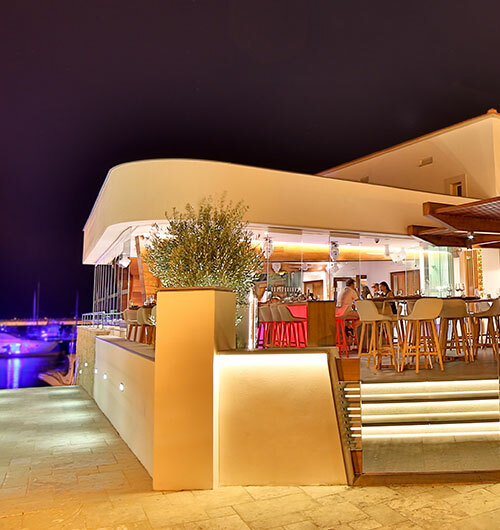 Marina Beach Bar, by PNS Restaurants, is located on Limassol Marina’s Peninsula. Boasting modern and minimal design elements, it offers a unique culinary experience serving the restaurant premises and users of the beach facilities! From snacks and impressive dishes to delicious desserts and an extensive list of beverages. Relax by the sea, soak in the sun on the golden sand and order your cocktail. 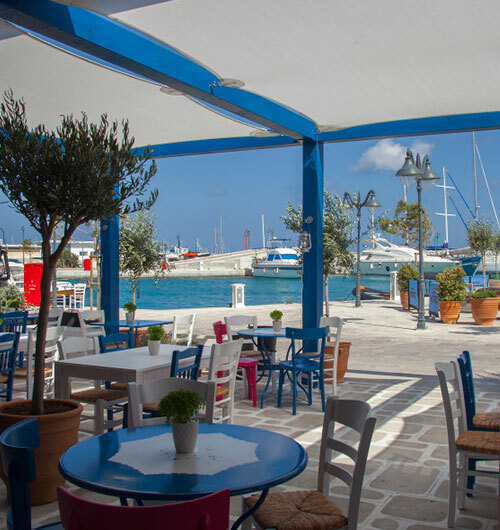 Marina Breeze LoungeBar is an all-day new venue by multi-award winning Breeze Group, specialised in the fields of clubbing, restaurants and lounge bars. Marina Breeze LoungeBar is the ideal destination for every moment of the day and night with menu selections from an International menu, signature cocktails from experienced mixologists, thematic nights for each day of the week and after-parties with DJ Set. Marina Breeze LoungeBar…the Ultimate Experience! 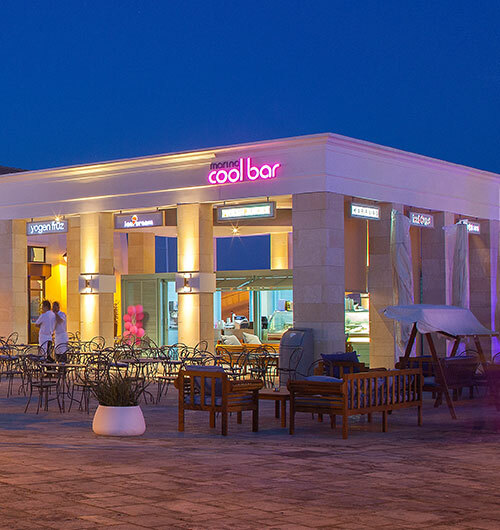 Situated in the heart of Limassol Marina, the Marina Cool Bar serves the finest ice cream, crepes, waffles, frozen yogurt, fresh juices, smoothies and coffee by the sea. It is an ideal place for a rest, a meeting with friends or family, somewhere to enjoy the rich variety of different flavours. From a healthy refreshment after lunch or dinner to a chat over coffee in a relaxing environment and with the friendliest of staff. 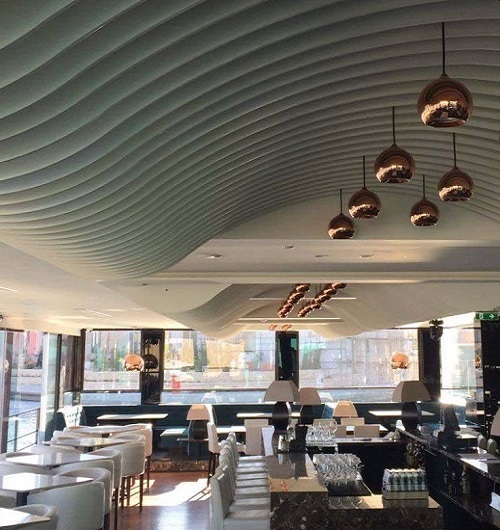 With a fully-stocked bar and expert bartenders ready to serve you, there’s no better place on the Limassol coastline to enjoy your favourite drink than the Marina Roof Bar. 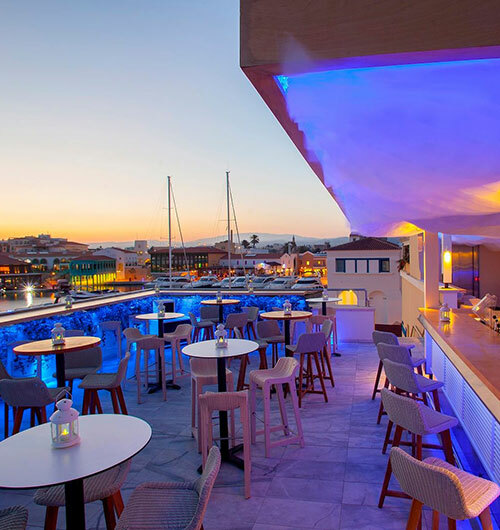 Take in the impressive view of Limassol Marina as you sip your cocktail, beer or non-alcoholic drink, and enjoy the funky tunes that add a special dimension to this venue’s unique atmosphere. Definitely the ultimate summer destination, any evening, every evening. 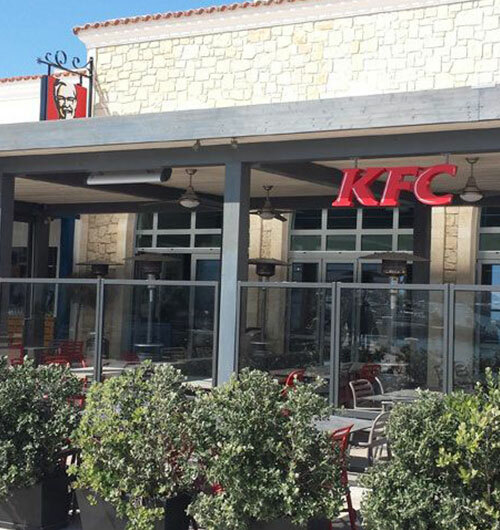 Pizza Hut at Limassol Marina is a unique addition to the largest chain of franchised restaurants in Cyprus with the perfect environment for you to share great times with friends and family! Either for lunch or dinner, you can enjoy delicious signature pizza combinations, appetizers, salads, pastas, chicken dishes, wraps, juicy BBQ Ribs, irresistible Wingstreet chicken, all made with the freshest ingredients, as well as tempting desserts, cocktails and coffee. Following a 10-year success story of consistency, quality and satisfaction in Nicosia, Pyxida Fish Tavern is now able to welcome you to its new, second home in Limassol. 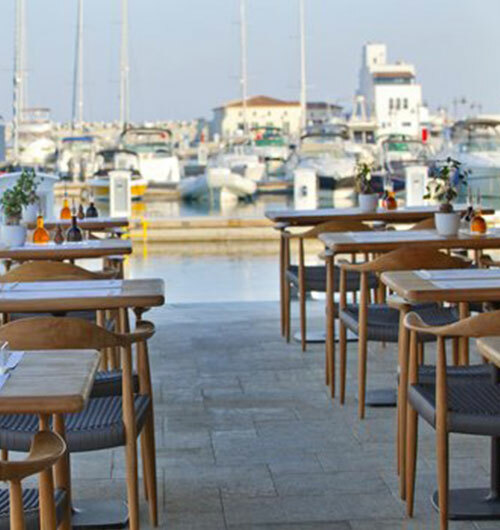 With breathtaking views of the sea, for the ultimate gastronomical experience, the owners are blending years of experience with a prime location at the new Limassol Marina for a taste as delicious and comforting as the environment. Delicious food on the grill, with the simplicity and rich taste that characterizes Cypriot and Greek cuisine, including favourite dishes like bougiourdi, feta with honey, sesame and the traditional Cyprus kebab. Accompany your meal with the house wine or with a choice from the wide variety of options available. 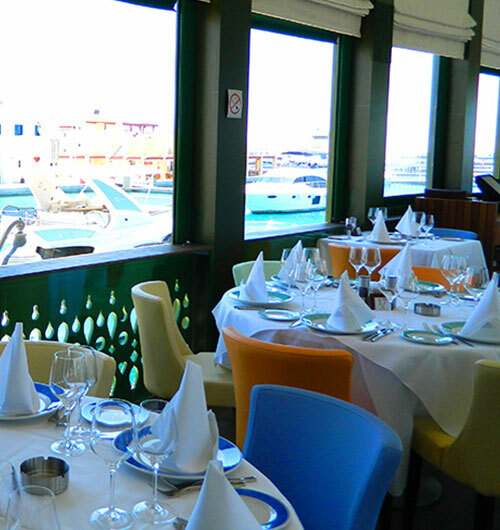 At Tavernaki you can enjoy your meal with friends or family in a beautiful traditional setting in the heart of Limassol Marina. 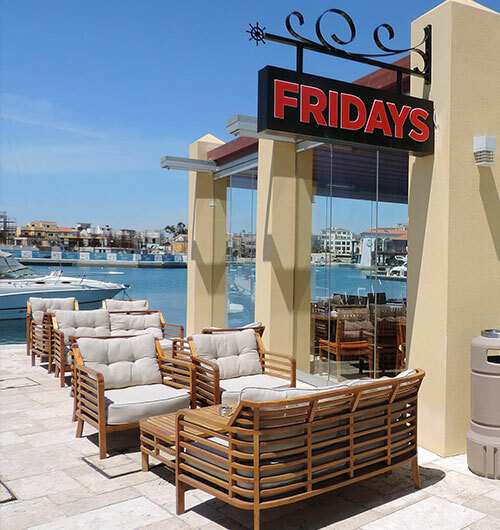 Overlooking the Marina, with breathtaking views, Fridays restaurant has a new innovative and fresh design. The uplifting music in the impressive roof garden and in the magnificent patio offers its guests a truly unique atmosphere. Fridays fun-loving flair bartenders serve fantastic cocktails, the friendly service along with the unique main dishes such as the Jack Daniel’s Grill and its Steak House Selects guarantee to make every visit a memorable one. The vantage point of the Limassol Marina; allow yourself to be lost in the ambiance of the Mediterranean, encompassed by panoramic views spanning across the entire coastline of Limassol and overlooking the quietly nestled Yachts within the harbour. Enjoy the fruits of our meticulous attention to detail where we have excelled in sourcing the finest wines from all corners of the globe and brought to life the fantasy and romance of fine Italian cuisine. Inspired by traditional Japanese, Indian, Chinese and Thai flavours, wagamama is designed to offer a new kind of dining experience – one that offers fresh Asian-inspired food in a friendly, vibrant setting. Zen culture, modern minimalistic space; the perfect atmosphere to discover the best kept secrets of the delightful Asian cuisine. The experienced Wagamama chefs prepare dishes full of authentic ingredients right in front of your eyes, in the open kitchen space.